All of us spend a large part of our lives at home- eating, sleeping, relaxing and interacting with our family members. Our home is a haven for us, away from the noisy, busy, polluted and stressful world outside – a place where we can literally let down our hair and unwind. Eco friendliness is the buzzword today and we all know that we should make our immediate environment as eco friendly as possible. This is not only good for our health but in this way we can make a small contribution towards the environment as well. Often we spend a lot of money on the decor of our home, either doing it ourselves or by taking professional advice. We spend hours poring over color guides about which shade of paint to choose for which room, and which type of furnishing will go with our furniture etc. When it comes to paint, choose water based, lead free paints which are safer than regular paint. As for furnishings, choose natural fibers such as cotton, linen or silk rather than synthetic ones. These fibers are recyclable and less hazardous to our health. Saving energy at home is a top priority. One good way to begin is with ‘insulation’. For this, install a false ceiling on the roof; the material most commonly used is particle board, easy to fix and easy to maintain. Alternatively, insulate the roof with either polyurethane or even charcoal sheets (the latter are easily available at hardware stores). A rather old fashioned but effective and ethnic way is to lay down ‘khus’ or rice husk on your roof. It is naturally eco friendly and will help to keep your house cool during summers. The only botheration is that it needs frequent changing and watering. You can also use double glaring on your windows and ‘seal’ the gaps beneath the doors, between the floor and the doors or in the windows. Insulating the roof and double glazing the windows works in two ways. It reduces the temperature in the room as well as prevents noise pollution (specially useful if you live on a busy road). It blocks out most of the sound, keeps you cool and at the same time helps reduce electricity bills. Sealing gaps saves energy and reduces air conditioning costs. Other than the usual sealants available in the market here is an innovative idea: use some colorful cotton fabric to make a caterpillar shape to fit beneath your door, and fill it with potpourri or scented dry flowers. It will have a three fold effect; save energy, brighten your room and add fragrance as well. Plan the kitchen to be bright and airy so that you don’t have to switch on the lights at daytime. Make economical use of the gas. Keep all ingredients for cooking ready before lighting the gas. Turn it to ‘sim’ when required – using it on ‘high’ burns a lot of gas. Use your microwave often – it will not only save gas but time as well. Keep two dustbins- one for organic waste which is recyclable (e.g. fruit and vegetable peel, used tea leaves, leftover food etc) and the other for non organic waste (tin, plastic etc). Empty the organic waste in a pit in your garden and you will get wonderful compost for your plants. The non organic waste can be disposed of as usual. Be energy conscious when buying large appliances. Today the market is flooded with energy saving alliances which will considerably reduce your electricity bills. Buy models with economy or half load buttons. When it comes to water geysers and other appliances buy the ones which have a thermostat installed in it, s that power is switched off automatically. Ensure that your refrigerator door is shut properly every time it is opened and try not to open the door too wide and not too often – it uses up more energy. Use energy saving light bulbs too. 60 watt bulbs are preferable to 100 watt ones and milky ones as opposed to the regular ones. Install zero watt bulbs in your room instead of a night lamp. Ensure that the shades of the bulb do not restrict light flow. Most decorative shades usually cover 50-70% of the bulb which tends to increase consumption of energy and reduces the light in the room. Install reading lamps at study tables where bright light is required. Instill the habit in your family members to switch off the fans and lights when leaving the room. If you are buying a new AC, buy a model which has a timer. 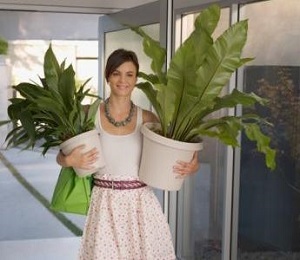 Plants are extremely eco friendly and can be used in innovative ways to liven up your home decor. Apart from adding a touch of greenery, they give out oxygen, thus purifying the air inside. You can keep potted plants in your home but be sure to show them some sunlight periodically. Also, clean their leaves with a wet sponge, specially if they are kept on a balcony, as dust and grime may cling to them. Creepers also look good but make sure they don’t damage the walls. A home tastefully decorated with plants looks attractive. Plants are a natural home decorating gift that owes renewed popularity to public concern about the environment. A foliage plant is a wonderful gift which will last and heal the earth and is sure to be appreciated. If you are living in a big city and do not have a garden you can make good use of your balcony and /or terrace to give you a fresh environment and create a tropical paradise. Keep some potted plants, creepers or trellis in your balcony along with a couple of low comfortable chairs for you to relax in. Do not make the balcony your dumping ground for unused objects (empty bottles, old newspapers, broken appliances, used tins etc) but make it an inviting and comfortable place where you can breathe in some fresh air and relax. Have your morning tea in your balcony and enjoy the fresh clean air before it becomes polluted. If you have a good terrace you can maintain a terrace garden, but do get professional help before embarking on this venture. Alternatively, keep some potted plants in the terrace. I know people who have an entire mini kitchen garden in pots in their terrace and balcony. Most of the time we think nothing of wasting water- we keep the tap running while we brush our teeth or wash utensils or clothes. Needless to say this is a huge wastage of a precious commodity. Try to re cycle water, e.g. the water used for washing vegetables can be used for watering the plants, the soapy water used after washing clothes can be used to clean the bathroom and kitchen sink and so on. If you have a shower fitted in your bathroom you will consume less water than a bath in a tub or with a bucket. While buying a washing machine choose a model which uses less water. While installing sanitary fittings choose models whose flush uses less water. Install a water meter to monitor how much water you actually use. All of us know that paper comes from the wood of the trees and deforestation on a large scale is causing havoc for our environment. Recycle paper in your home by writing on both sides of the paper, using the leftover sheets in your children’s notebooks for rough work, cutting up large calendar sheets for making lists etc and so on. Try buying recycled paper products, these are of good quality and there is no difference in terms of hygiene and strength when compared to the traditional ones. You can make a small contribution to the environment by using as less of polythene and aerosol products as possible. Use eco friendly room fresheners or aromatic candles instead of the aerosol canned artificial ones. Thus the few tips outlined above can be added to your personal home making skills to have a green clean home and feel fresh and rejuvenated in the process.